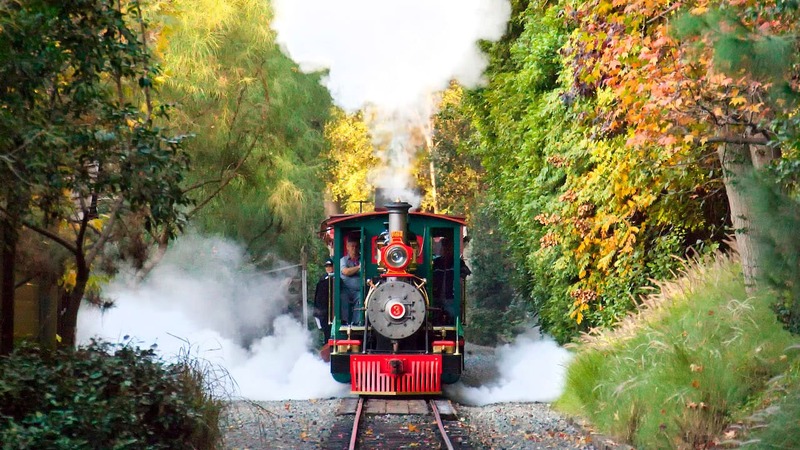 When the iconic Disneyland Railroad and the Rivers of America attractions return to Disneyland park this summer, guests will discover new magic aboard these classic experiences. As we first shared last year, and seen in the artist’s rendering below (courtesy of Walt Disney Imagineering), the gorgeous new north bank of the Rivers of America will feature a beautiful new waterfront and an elevated trestle over which the iconic Disneyland Railroad will travel. The Rivers of America will continue to celebrate the Mississippi, Columbia, Missouri and Rio Grande rivers, enhanced now with a new Columbia Gorge section, highlighted by thundering waterfalls – signaling the return of large waterfalls to the rivers. Longtime Disneyland park fans will remember Big Thunder River Waterfall and Twin Sisters Waterfall; five spectacular new waterfalls along the Rivers of America harken back to these favorites – all on display for guests aboard the Mark Twain Riverboat, Sailing Ship Columbia and Davy Crockett Explorer Canoes. 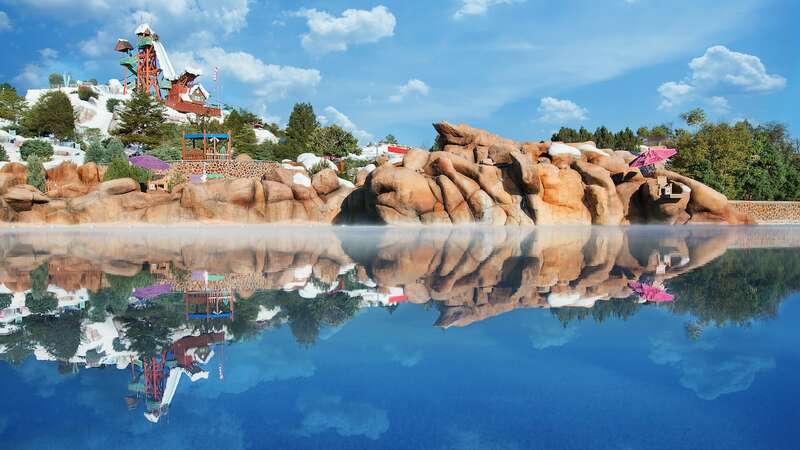 Guests will also experience these features from aboard the Disneyland Railroad, which will travel across the rocks on a trestle that will even extend onto the river, providing a breathtaking view of the new waterfalls. And, for the first time ever, the Disneyland Railroad will be making a left-hand turn as it circles the park. In addition to the new waterfalls, Disneyland park fans will spot some familiar faces along the Rivers of America as well as throwbacks to Frontierland’s past. The Indian Village, now in a new location, will include a more prominently featured Shaman, seen telling the story of how the woodpecker taught the Indian chief to make a flute. We’ll have more to share on these returning attractions soon – including opening dates – so keep an eye on Disney Parks Blog. I am hoping that the Columbia Gorge section has a Multnomah Falls and the petroglyph “She Who Watches” in it. That would be amazing! I can’t wait to experience this new rendition. Though my favorite, is the dinosaur Grand Canyon scene. It’s in Dire Need of an Update. It might be better to say the train is making a left turn FOR the guests. The train has had , for a long time, a service track that is a left turn( under the Monorail Barn) . I am surprised that there hasn’t been anyone explaining why there are so many waterfalls being added. Two words: white noise. It will help mask any sounds leaking over from Star Wars Land.I have been visiting Disneyland since 1955, and always love to see new things, older attractions improved, and best of all, the landscape. Will we still be able to see the Grand Canyon and dinosaurs between Tomorrowland and the Main Street train station? It would be really sad if that’s gone! How soon is “soon”? When will you be able to announce the opening dates? I LOVE that our area will be part of the story. In regards to the remarks it won’t look right or that it was just built to hide Star Wars which is also going to be amazing btw. The Grand Canyon and Jerassic areas of the story are still fun even though they are not spot on adaptions. On a recent visit, we asked a castmember at the NOS Station who told us that the train is set to reopen on July 31st — IF nothing goes wrong. Between the train and the monorail, this is a bad summer for transportation at the Disneyland resort. At least we’ll all be getting our steps in. I visited the Columbia Gorge once not too long ago and it was magnificent. Anything Disney can do to remind us of America’s natural beauty is appreciated. So glad to get the Indian camp back! I’ve missed it ever since Bear Country replaced it. Jeff Johnson, I, too, am a Gorge native and am a bit skeptical. I’ll check it out in December and see how they’ve done. Yay. I was pretty bummed thinking my son wouldn’t be able to experience this during his first year at Disneyland (AP Member), But I’m so glad it’s back and better than before! Can’t wait to get in those canoes and the mark twain. Any word on the return of the Living Desert or Rainbow Caverns? Is the burning settlers cabin coming back? As a huge Disney freak I can’t wait! I wish they’d also paid homage to one of my favorites of the past…..the painted desert with the geysers and paint pots! I loved and miss it! But the train ride will definitely be upgraded and hopefully it’ll meet Walt’s standards! I don’t think that is quite true that the railroad has never made a left-hand turn before. When the Park was first built, the back stretch made a very slight left-hand jog–probably not even noticeable as a curve to passenger, but a left-hand curve nonetheless. Excited to get back on the Disneyland Railroad and Rivers of America. The left turn will be disorienting and wonderful all at the same time. Can we talk about renaming “Indian Village?” Have you spoken with tribal leaders from the regions represented about their feelings regarding this? I’d also like to know what is happening with TSI. The refurbishment on the fort started something like ten years ago. What’s going on with Tom Sawyer Island? So that means the Train will be in full operation? Obvi, after the trestle bridge, the train will turn left to reconnect to original route behind fantasyland theater. Please get the dates for the RR and the Rivers of America dates ASAP. We need to reserve Hotel and Air ….. The left turn is part of the NASCAR tribute you be going by on the route. So the railroad is becoming more like Space Mountain. Mostly Right turns but some left hand turns. I’m sooo hoping it opens when we’ll be there!!!! Beginning of June!!! So Happy!!! Our Beautiful park is coming back!! Think of the left hand turn as an arc rather than a turn. The route is no longer a triangular curve around the perimeter of the park(which was “all right hand turns” (or curves/arcs)). It now makes a sharper turn to cut into the new ROA trestle area mentioned, then curves back left (and also right again) to get back up to the (roughly) original path behind Fronteirland as it heads toward IASW. I hope primeval world is still there? A LEFT hand turn? How is that possible??????? Sounds cool with the waterfalls – I dont recall there ever being waterfalls before – when were they removed? I love the canoes – will we be able to take the canoes behind the waterfalls? As an Oregon resident, I love the idea of a Columbia River tribute in the RoA! Can’t wait to see it! 1. Is the order you listed (Mississippi, Columbia, Missouri, Rio Grande) the order in which they are encountered by guests on the river? 2. What real-world features (if any) inspired the scenery and landmarks along the Rivers of America – especially in the new Columbia Gorge section? when this summer? Some time in June? We’ll have dates to share soon. I’m really looking forward to having the river open again. SO thankful Disney refrained from adding Spiderman or Captain America somewhere as the “new magic”. So stoked for that Left Turn!!!!!! !